The quest for an MLB article continues. Jack sent out letters to 9 MLB teams requesting interviews. We heard from the Mets and Jack interviewed reliever, Scott Rice, who was super nice. 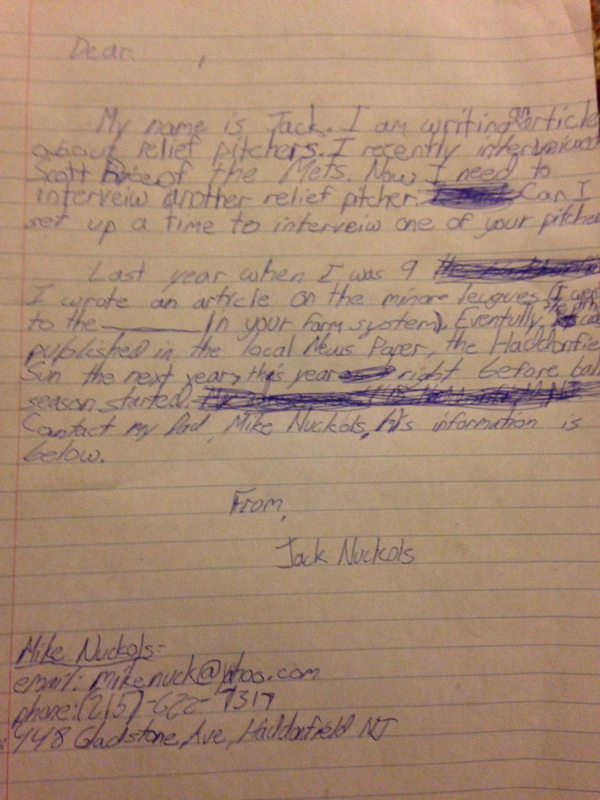 Jack has now written a second letter – he has decided to focus his article on relievers. My name is Jack. I am writing an article about relief pitchers. I recently interviewed Scott Rice of the Mets. Now I need to interview another relief pitcher. Can I set up a time to interview one of your pitchers? Last year when I was 9 I wrote an article on the minor leagues. Eventually, the article was published in the local newspaper, the Haddonfield Sun. Contact my dad, Mike Nuckols, his information is above. Really hoping he hears back from these guys.